Rational storage of things in a small apartment. 19 facts about the beds. « Choose a cabinet for TV. A very important component for the kitchen is the furniture, or rather its quality, because its service life and appearance will depend on it. Already as an axiom sounds the statement that for kitchen furniture you need to choose only the highest quality materials. 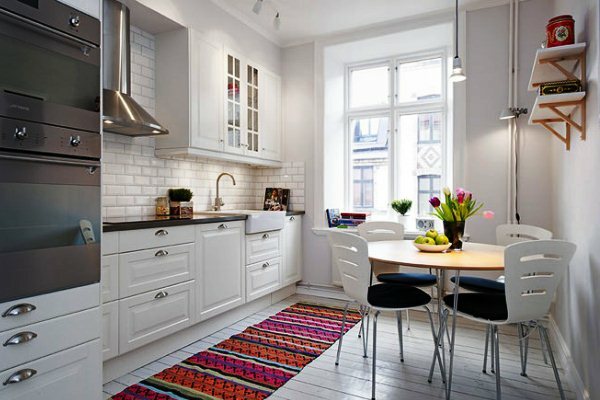 In this article, we will talk about the important part of kitchen furniture, the countertop. Consider all possible materials for its manufacture, as well as analyze the pros and cons of each of them. Countertops can be made from: wood, laminated chipboard, artificial stone, steel, stele or natural stone. Each of these materials has a different cost, boasts its own advantages and disadvantages. Also, the choice of material for the countertop depends on the style in which all the kitchen furniture is made. This is the most familiar, we can say the classic material for the countertop. 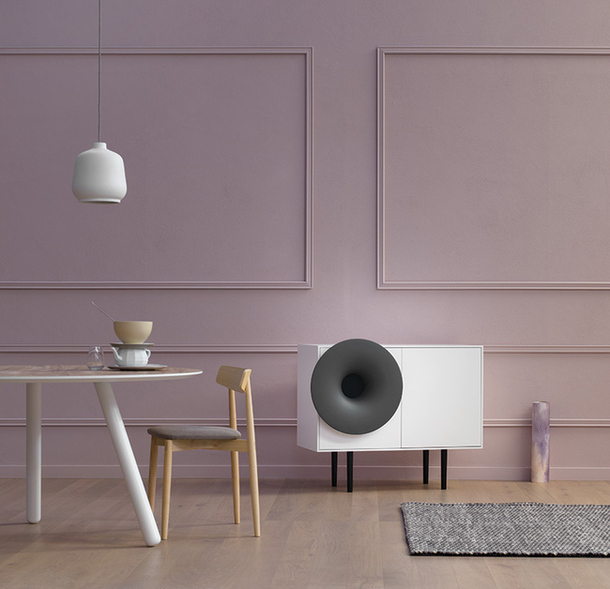 It fits perfectly in almost all styles of furniture design and interior. For its production mainly used composing boards of hard varieties of trees, of them produce plates that are glued together and gently polished. 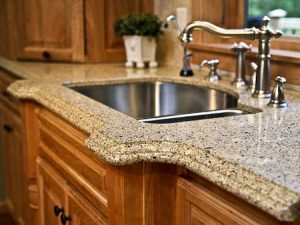 In order to protect the countertop from adverse factors, and in order to give it strength, it is treated with special oils. It becomes moisture resistant and resistant to temperatures. The main advantage of a wooden countertop is that it will be environmentally friendly, and this is very important for the kitchen. It will give the furniture a great, stylish look. In order to increase the service life of wood countertops, it is recommended to use special protective equipment. Kitchen furniture with laminated chipboard. At the moment, this material is the most popular and common. These countertops are very simple to manufacture and have the most affordable price on the market. It is possible to give any color to the table top from laminated chipboard, which is a great plus, and also it can be given an imitation of almost any material. This material is completely resistant to UV rays, it does not fade. Worktop from chipboard will reliably serve for a long time. But, you should make sure that the water does not fall into the seams on the tabletop, otherwise it may swell and lose its “aesthetic” look. Acrylic plastic, or as it is also called “artificial stone”, is a very popular material in the production of kitchen furniture. This is a very practical and accessible material. It is possible to configure from such material absolutely any surface, and outwardly it is very similar to natural stone. The surface of acrylic plastic is durable, reliable and moisture resistant. But it is worth being cautious with hot items. Putting them on the countertop without a stand is undesirable, because it can spoil it, leaving traces. But in the end, this material is durable, financially profitable and looks very beautiful and stylish. Countertop made of natural stone: granite, basalt and marble. Natural stone, of course, will be much more expensive for the price, the furniture must also be durable to withstand the considerable weight of the tabletop. kitchen furnitureThis countertop is made of granite or basalt slabs, the thickness of which should not exceed 3 cm. In order to be able to install appliances, special holes can be made. This material boasts an enviable strength, durability and excellent appearance. The main drawback can be considered, of course, the price. For such a pleasure will have to pay. And the surcharge will require not only the tabletop itself, but also the furniture itself, since it weighs a lot, additional, reinforced fasteners will be needed. Marble is processed in a very simple way, so almost any worktop can be made from this stone. Marble belongs to the stones of medium hardness, and it can be vulnerable to mechanical damage, as well as “afraid” of the effects of acids. But such a surface is “fearless” to moisture, temperature and fire. 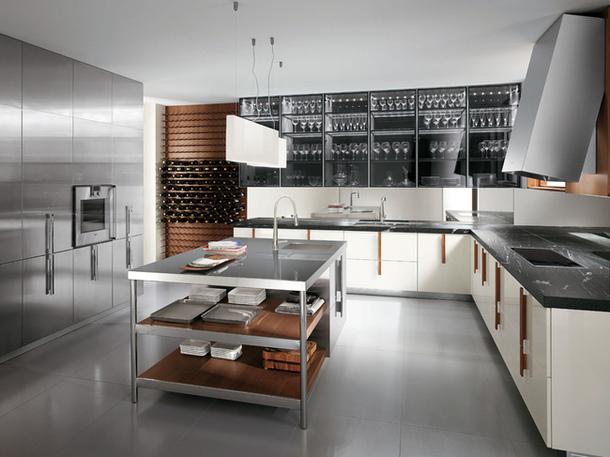 Recently, metal elements in the kitchen are becoming increasingly popular. This is particularly true for countertops. The vast majority of worktops for a professional kitchen are made of steel, and this is explained by durability, ease of use and maintenance. Such countertops are not afraid of either moisture, or temperature, or the effects of acids. Such a solution will be modern and stylish, because many designers choose this material. Glass undergoes the process of “hardening” in order to resist damage and moisture. However, such material requires more careful use and careful maintenance to avoid scratches, stains and plaque. All materials have their own advantages and shortcomings, but each of them will be very appropriate in the kitchen. When choosing is worth guided by their wishes for design, as well as the available amount of money. How to equip a small bedroom?